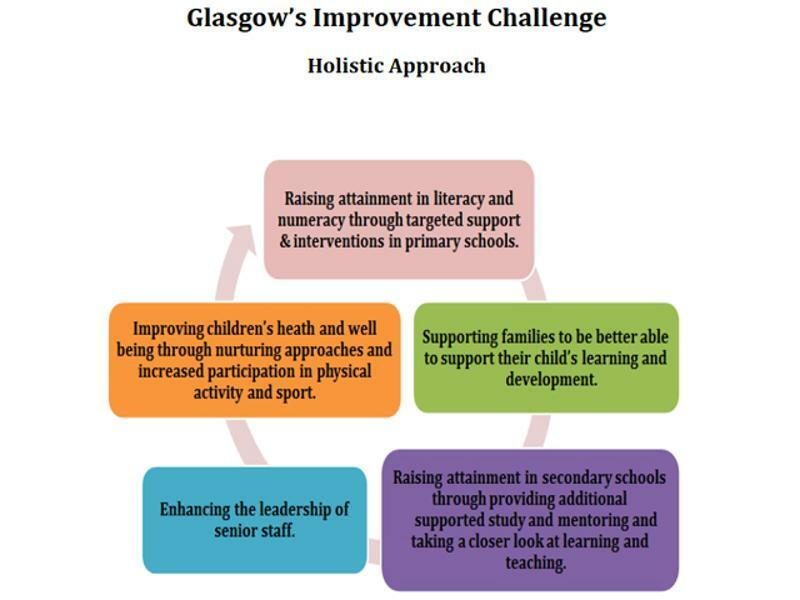 Glasgow's Improvement Challenge 2015 - 2020 is a holistic strategy for raising attainment and achievement for all children and young people and incorporates the Scottish Attainment Challenge. Our strategy for improving numeracy and literacy across Glasgow's primary schools takes a two-pronged approach: Glasgow Counts, to raise attainment in numeracy, and Literacy for All, to raise attainment in literacy. Glasgow Counts aims to fill young minds with a sense of agency and endow them with the motivation, courage and belief in their power to influence their own futures. We want our young people to engage with mathematics and build their comprehension of the subject across the curriculum. In addition, we aim to build better mathematical understanding in and beyond our classrooms. Key messages are communicated through high quality CLPL which enables practitioners to build capacity in their establishments. In making what is sometimes seen as complex accessible, we are steadily debunking the popular myth that there is such a thing as being 'no good at Maths'. Recently, we augmented our existing programme with a comprehensive package which aids understanding and implementation of Number Talks. In collaboration with the Leaders of Early Learning and our secondary school colleagues were now have 3 interleaving programmes: Glasgow Counts in our playrooms, primaries and secondaries, providing full coverage of the 3-18 curriculum. We have also increased partnership working with GDSS and PEPASS teams, in order to enhance our provision. Literacy for All is an evolving framework which aims to build capacity and develop understanding of Literacy as a transformational tool. LfA approaches help to develop consistency across Glasgow's establishments, raising achievement and engagement through examining what works and how best to support our learners. LfA provides a suite of CLPL to help practitioners focus on high quality, evidence based approaches to improving reading, writing and listening and talking. Our reading programme includes core areas such as phonological awareness, reading strategies to enhance metacognition and digital and critical literacy. Practitioners are also given opportunities to explore the genre approach in writing, and to assist in the evaluation of writing progression a toolkit called 'Routes through Writing' has been devised. In 2018 we embarked on delivering our listening and talking programme, which has a high emphasis on addressing the vocabulary gap. Closing the attainment gap in Glasgow requires us to have creative and innovative approaches; examples of this can be seen through effective use of partners such as music specialists and engagement through film literacy to take account, not only of the child's experiences and interests in school, but also their experience at home. We aim to ensure that our approaches and strategic guidance instil a sense of ownership and confidence in practitioners and school leaders as they strive to provide learning experiences fit for the 21st century learner. This in turn will equip Glasgow's young people with the tools that they need to embark on positive destinations, to become lifelong learners and to find their place in society. FOCUS is a Glasgow City Council developed intranet based application. Focus support schools to access and interrogate holistic data across the BGE in line with Glasgow's Improvement Challenge (2015-2020), which includes the government's Scottish Attainment Challenge. Focus lets schools examine their CFE levels through a number of lenses including EAL and SIMD. For benchmarking purposes schools have been allocated comparator schools. FOCUS also provides access to an equity profile which allows schools to examine themselves within a citywide context through a single graphic.